The Turner Prize-nominated visual artist David Shrigley has created a personalised artwork to help raise funds for the Brighton Dome's refurbishment project. 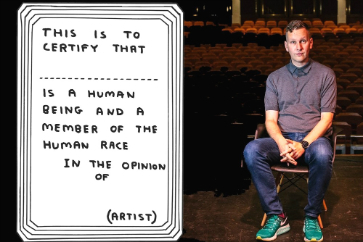 The artwork, Certificate of Human Status, features Shrigley's distinctive satirical style and names the recipient as 'a human being and a member of the human race'. "As a Brighton resident, it was an honour to be the Guest Director at this year's Brighton Festival and I had the opportunity to find out more about the exciting redevelopment of the Brighton Dome venues. "I think it's crucial that Brighton Dome is able to provide spaces to help support and nourish artists and their work." Proceeds from the sale of prints will go towards the Build Brighton Dome community appeal. The Grade One-listed Brighton Dome Corn Exchange, formerly the Prince Regent's Riding House, is being restored to reveal previously hidden heritage features as well as provide increased capacity seating, a magnificent new viewing gallery and a creative space for artists to rehearse and develop work. Major improvements to the Studio Theatre - once a supper room - will include balcony seating, new bar facilities and a street level café opening out onto New Road. The limited edition A4 prints have been screen printed by hand at The Private Press studio in Brighton and are available to buy online for £195 (plus delivery). Each print will be personalised, signed and numbered by the artist.